The company takes part 5 floors in the renovated building Voentorg. Office is designed “for growth”. On the development and consolidation booked about 15% of the area and jobs. At present it employs approximately 110 people. The hierarchy of employees not emphasized. All very democratic. Designated managers are in open space, workstations are the same as that of ordinary workers. The office has only one office, but a lot of colorful negotiation – home at 10 and 8 seats, trening-room, a place for presentations. Here really care about people, about a comfortable job, why have not stinted on equipment places for recreation. Previously, employees of the Moscow office housed in the offices, and are accustomed to isolation. The abundance of areas for socializing, not least dictated by a desire to smooth out the negative from the transition to work in open space. Designers had to use products that meet the corporate style. Regulated colors for offices Nokia – orange, green, blue are present everywhere – in flooring, furniture and wall colors. Also stipulated the principle of zoning with different levels of lighting and installation of ceilings. Have to be a “roll call” in the design of the ceiling and floor. Design of the Moscow office was created by the same team of architects, which designed the interiors of the company in Finland. In fact, all Nokia offices in different countries have common features. Although no copy no. For example, the reception desk will be done to a tee, but always very similar to other reception at Nokia. In this project, consider the Russian specifics. Some things to our compatriots difficult to accept. For example, throughout the world in the offices of Nokia employees have different jobs. No usual tables. In the Moscow office of the company have found a compromise: the individual left the place, and instead of pedestals next to a table set special cabinets. In the decoration of their offices Nokia tries not to use natural materials. The only exception – the wooden ceiling in the recreation area and small bar in the dining room. Says manager logistics office NOKIA, Marina Skoltsova: “All the interiors of NOKIA in the world is now organized into open space. The old office in the mansion Stoleshnikov was one of the last, where they worked in offices. In the West, widely implemented the system mobile office when people are not secured in their jobs. We expect that this will become our reality in a year and a half. We have a clear forecast of how many in the Moscow office will be outside and how many permanent staff, a number of guests and customers. Based on it, is calculated as the space should be organized. I try to accommodate all the “global” standards, to our Russian reality, and make the work of my colleagues, most convenient and quiet. Our interiors with Jari Inkin – Finnish architect who designed the main office of NOKIA in Finland. 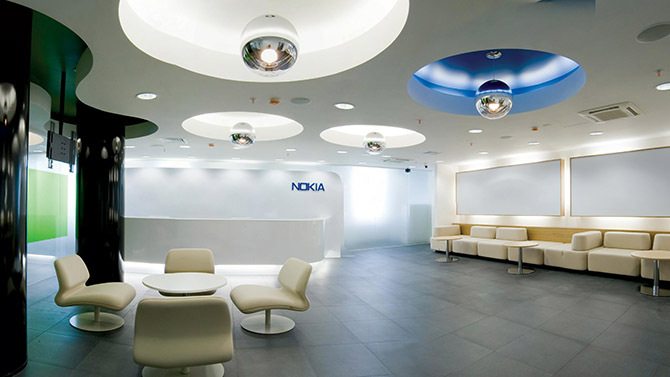 It is believed that in terms of technology and design – the Moscow offices of one of the best NOKIA. Convenient layout, modern design, beautiful acoustic ceilings, good insulation in false-floors. In terms of technology all decided very wisely, for example, Wi-Fi in all areas of office, instead of projections, we use plasma panels, which enables to arrange entertainment, beautiful presentation. What distinguishes the Russian office of the other? Finnish architects have done to us two reminders of the “spirit of place” – a lamp in the work area and lobby surrounded by classic embossed rosettes, and the kitchen is decorated with lights, reminiscent of the church dome.